You can find information about Neem Ka Thana Railway Station, Rajasthan. 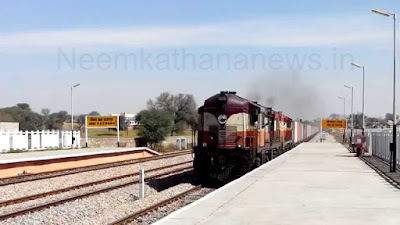 If you are planning to travel to Neem Ka Thana by train, get complete information about Neem Ka Thana Train station , nearest railway stations and nearest airport to Neem Ka Thana, distance to Neem Ka Thana from major Indian cities and most of all, the list of trains to Neem Ka Thana. Route Map of trains to Neem Ka Thana along with Neem Ka Thana station location map. The Complete list of Trains to Neem Ka Thana, Trains from Nim Ka Thana and Trains passing through the Neem Ka Thana Railway station in the state of Rajasthan. 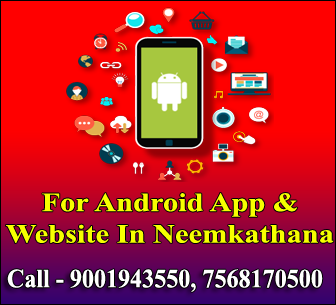 Scroll down to view a map showing the location of Neem Ka Thana Station and other information like Neem Ka Thana distance to other cities, airport location etc.. Choose The train name to get more information about the train, its route, on which days they arrive at a particular station etc.ear By Airports to Neem Ka Thana Railway Station Closest airport to Neem Ka Thana Railway Station is Sanganeer Airport - (101.62 Km / 63.14 Miles) Following are the nearest airports to Neem Ka Thana and Neem Ka Thana Railway Station. Distance to the two airports is given in bracket.